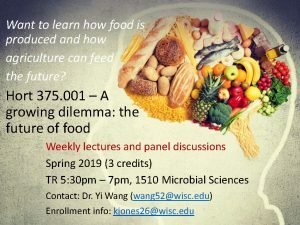 Dr. Yi Wang will be teaching a new course this spring called “Hort 375-001: A Growing Dilemma: the Future of Food”. It will be offered on Tuesdays and Thursdays, 5:30-7:00 PM in 1510 Microbial Sciences Building. In the current world, the environmental challenges posed by agriculture and food production are huge, and they’ll only become more pressing as we try to meet the growing population worldwide. In this course, we will teach and discuss opportunities, challenges, controversies, and the future of agriculture and food production systems: such as GMO food, organic food, urban food systems, climate change and its impacts on agriculture, agricultural sustainability, etc. the second class offered on Thursday will be a panel discussion conducted by two or three panelists. The panelists are UW faculty members or extension educators who are related to agricultural production, or farmers, processors, agricultural consultants, company representatives, or state government employees who are working on related topics covered by the class. The final exam on May 9 will include multiple-choice questions and open-ended questions. • Explain how farming systems are operated and how the food we eat every day is produced. • Identify factors that can affect the future of our food production. • Find and evaluate sources of information regarding food production and agricultural sustainability. • Recognize job opportunities that are available in the agricultural industry.